Description: A large plastic crucifix marks the spot of this accident. This gruesome Jesus statue isn't holding up well: the left hand is broken off, and most of the right arm is gone. A second cross covered in fake flowers also adorns the site. A jumbo pot filled with a plethora of fake flowers lies behind the crucifix. Lastly, a stuffed elephant and two vases with dead flowers complete this memorial. As with so many white crosses, pieces of the death car are strewn around the area. Analysis: Man, I love this monument!! The plastic Jesus looks just like the ones you find in Tijuana: bloody, grisly, and very tacky. The missing limbs only add to the misery. As the Christians like to say, Jesus loves you some much it hurts, and this tribute proves it! 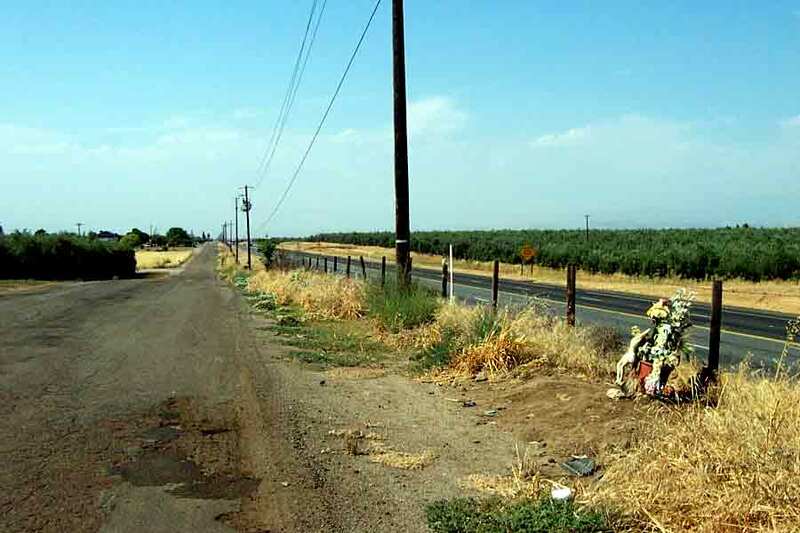 As for the accident, Road 232 lies alongside an olive orchard, and has a nasty blind hill at this site. I'd say the victim drifted over the yellow line and went head on with another car. Splatterama! Since no info is provided, all I can glean about the victim is that he was Catholic, and hence probably Hispanic.